Experienced AABA beekeepers will be hosting a new beekeeper session one full hour before the regularly scheduled meeting time (5:30pm). Please bring your bee suit and veil. We will open the Arlington Echo hives to see what is happening with each colony and will have a Q&A session. The speaker for our June meeting will be Barry Thompson. Barry began keeping bees in Tennessee in 1954 and since then, has kept bees in Indiana, Mississippi, Texas, Germany, and Maryland. In Maryland, he established a company providing pollination services to orchards and pick-your-own farms in Montgomery County. 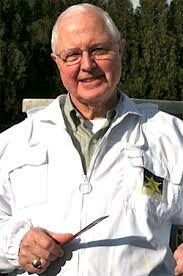 Barry is a certified EAS Master Beekeeper and has served as EAS Director for Maryland. He is the immediate Past-Director, of Master Beekeepers. He volunteers as a scientist at the Bee Research Lab at Beltsville. Barry has made presentations at EAS and other national beekeeping events and participates in the educational activities of his local and state associations. In 2008, he assumed the position of Medical Director, American College of Medical Genetics, Bethesda. He will be discussing bee sting reactions.